← Victorians beware: New push to install smart meters! Despite many requests, Victoria’s Energy Minister Lily D’Ambrosio refuses to permit the removal of the communicating chip from a smart meter causing irrefutable suffering and pain. “RESERVOIR retiree Sergio spends his nights in a cramped and freezing garage, surrounded by bird cages and old furniture. Whenever he tries to sleep in his own bed he wakes up with pain, dizziness, and has difficulty talking. Sergio said these problems started in 2013, shortly after a smart meter was installed at his home. Testing determined the meter was within the current safety standard but Sergio and his wife Agatha believe he suffers from electromagnetic hypersensitivity (EHS) which affects his pace maker. Sergio sleeps in the garage because it’s the furthest point from the meter on the property. “The first night we slept in (the garage) it was like a paradise for him,” Agatha said. The controversial condition isn’t recognised by the World Health Organisation, but is an increasingly common complaint. The Australian Radiation Protection and Nuclear Safety Agency said there was no established evidence that smart meters caused health issues, but research was ongoing. The most famous case of EHS was in 2013 when Dr David McDonald was awarded compensation after the CSIRO required him to work with electronic devices, giving him headaches and other health issues. 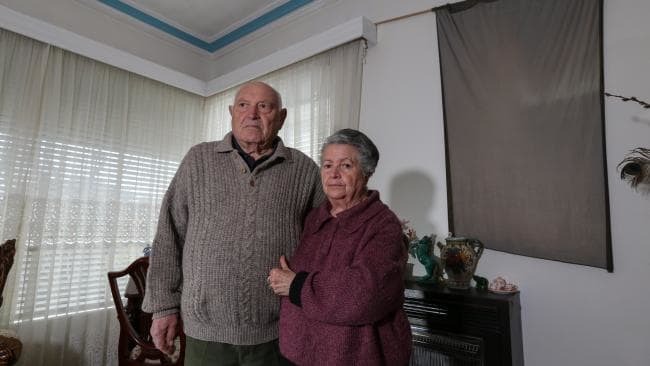 For two-and-a-half years, Sergio and his wife Agatha have been asking Jemena to temporarily remove the transmitter to see if Sergio’s health recovers without it. Agatha said she offered to pay up to 12 months in advance and extra for any charges. The company visited the house multiple times and initially put a mesh net on the wall with sticky tape and moved an aerial to the roof but Sergio’s health continued to decline. Jemena spokesman Michael Pintabona said an ombudsman investigation found the company’s actions were reasonable. The ombudsman also concluded under current law, a smart meter can’t be replaced with a manually read version. Now Sergio is seeking an exemption to the law through Energy Minister Lily D’Ambrosio, who visited the property in February. Agatha said she was sick of the couple’s calls for help being ignored. Does Minister D’Ambrosio have a heart?? The Victorian Labor Government promotes itself as “Putting People First” – Such dishonesty! This entry was posted in Smart Meter and tagged Adverse health effects, Electomagnetic Hypersensitivity, Jemena, Lily D'Ambrosio, Smart meters, Victorian labor government. Bookmark the permalink. ‘The Honourable’ Lily D’Ambrosio MP has an ARTS degree & a Diploma in Public Policy. Interesting qualifications for such a position as Victorian Energy Minister. Suggestion: Contact Ryan Carlisle Thomas Lawyers. The first interview is free. With regard to EMR/EMF, ARPANSA have a duty of care for all Australians. Jemena placing a mesh net up with sticky tape & moving an aerial was deemed reasonable by EWOV. Clarification of whether having a pacemaker (as well as known carcinogenic effects of EMR/EMF on metal implants, including heavy metals in the body) constitutes a disability under the Human Rights Commission Disability Discrimination Act would be required. if he owns his house he should just get it replaced with an old analogue meter by a private electrician. Would he be breaking any laws if it was done since the gov have admitted its not mandatory? The (totally uncaring) Victorian government only allows microwave-emitting meters to be installed for new/replacement meters. an electrician won’t do it. I imagine the officials are scared of losing their jobs if they fail to tow the line? Cedar, these ppl dance to a different tune, they basically take orders and switch off their conscience. Just wait until 5G comes around ,if smartmetres are bad, 5G will be genocide with epic proportions. What will we hear about that, doctors are already massively concerned but no way one listens…. I completely understand what Sergio and his wife are going through. I am in a very similar situation, I have and still am suffering symptoms just like Sergio. I was sleeping in my main bedroom, that had, unbeknown to me, as I am renting, ” 4 Smart Meters ” in the meter box attached to the outside wall of the main bedroom. I always had trouble sleeping in that bedroom, moved my bed around the room, but it got worse. I suffered Dizzyness, Head aches, developed Tinnitus, which led to Insomnia, which led to High Blood Pressure. There are possibly other symptoms as well. I have been battling with the energy Companies, the Energy Ombudsman, The Minister for Energy, no one wants to own the problem. They disregard all the opposing Evidence to the narrative that they want to follow. They quote this and that, they use ARPANSA as a defence, but all ARPANSA do, is to Register your Health Complaint, they do not investigate, no one does. The energy provider said that ” They would Turn The Smart Meters Down To The Lowest Level SonThat ?They Can Still Transmit “, why aren’t they at the lowest level anyway. I now sleep in the second bedroom which is further away from the Smart Meters, but of course I still have the Health Issues. I now take various medication, including a sleeping pill, to help me get to sleep, and help me get through the night. It would seem that a ” Class Action ” is required, there was no problems with Analogue Meters. Originally I also heard Music, and would get up to see where the music was coming from, no Music from outside, whether it was feedback from the Smart Meters, I have no idea. So I would support Segio. These people (government) don’t believe there is a problem, don’t any of them have smart meters in their homes? Surely they can’t all be impervious to the radiation. Obviously some of us are expendable. When the situation has become epidemic because the electromagnetism is cumulative, who will be held responsible? Government Haha; they always have an out! The Minister has a Duty Of Care and if she is not prepared to carry out that duty she should be sacked. The problem is that Politicians seem to be exempt from everything. No responsibility, No Answerability , No Accountability.